ProProfs is a powerful learning management system that helps instructors to create and deliver online training courses. The LMS offers both businesses and educational institutions comprehensive training solutions by allowing them to create online courses, complemented by tests, surveys, polls and even a knowledgebase. Work for ProProfs Training Maker? Learning about ProProfs Training Maker? "To speed up learning is a very good product"
I like it a lot, since my experience in this product is based on the fact that the company implements this software to provide easier and easier training to users, I am reminded that the training can be administered online, what allows me to see the actions of the trainees, and that other users entered during the training, being able to assign them a rating according to their work and performance during the training, and the best thing of all is that everything is done in real time. The interface becomes a bit boring when you become familiar with the software, and my opinion would consider if the trial period adds a little more days. It is an excellent software I recommend it and more for those group leaders who want their group to be the most outstanding, this software is ideal do not hesitate to acquire it. With this software solve some problems that in the future would bring accounting hiccups, I needed my group to handle the same level of accounting knowledge so that the advice of our clients was faster and more efficient and ProProfs Training Maker helped us a lot with this point, as It also helped us see beyond the future, because we could also train clients external to the company. "A robust e-learning tool that saves time, efforts, and money." Ease of use and the fact that it has no comparison. That’s how good it is. The 15-day trial period. I’d suggest that the trial period is made of at least 30 days. I won’t think twice to recommend it to any anyone. Go for it. You will be glad you did. Until recently, traditional classrooms were the mainstay of our training. But soon I realized their shortcomings in relation to working students who could not attend the classes due to hectic schedules. ProProfs Training Maker was a savior for me as it enabled me to course-correct the problem faced by many students. Now they can easily access the training programs anytime, anywhere. That’s quite a huge relief for all of us. ProProfs LMS is an excellent software application used for creating online training courses. It not only help learners to understand the courses better but also helps the instructor to track the learners’ performances. You can plan, manage, implement and assess the data according to your convenience. With interactive learning, ProProfs LMS aims at delivers highly-engaging and informative content in the form of audios and videos. The interface becomes monotonous after using it a while. I use ProProfs LMS to train my employees regarding the compliance. I think it is easy to implement and saves a lot of time. Previously, I used to give the compliance training to my employees in a traditional classroom way due to which employees feel bored and disinterested. However, after using ProProfs LMS, employees can attend the training courses anywhere, anytime according to their comfort and convenience. "One of the best Online Workplace Training Pages"
This web app is amazing. I can easily make training and courses which targets different audiences at my organisation. The existing training are highly engaging and cost effective. I have used this for the past 9 months and I would say its the best ! The Course can very effectively be customized to suit each groups needs. "Best for providing Effective Employee Training"
The training maker is perfect for creating online employee training as it offers handful of features. You can also track employee performance and progress in the real-time. The trial period should be extended to one month so that the user get a better hang of it. I am a business owner and previously was unable to make my employees understand about the objective and goals due to lack of resources. After when I started using ProProfs Training Maker, it was so easy to explain business complex concepts, objectives and goals to the new as well as existing employees. ProProfs was the ideal solution for us to do an online recorded training assessment without having to monitor every single submission. It was completely automated and efficient. It took us a few tries to figure out how to add some pictures and videos into the training assessment, but not too much difficulty. Automation! We have been able to successfully get over 300 people through an online training program automatically vs. us interviewing in person. The ability to create courses from previously existing content that I have on word, excel, and powerpoint. Creating quizzes is also very easy. My students said that they were able toggle through questions and access material in the course much easier compared to schoology. It is not as easy compared to other LMS platforms to integrate other apps into the LMS. Apps include adobe connect, YouTube, or critique it. Recommend ProProfs if you want an LMS that will enhance your orientation and make it easy for personnel to be integrated into your business. It is sometimes difficult to teach our lessons to all of our clients who are spread to various places from Alaska to Canada. ProProfs solves the geographic challenge that we experience. We are also able to record our sessions and post them for other and incoming colleagues. This software is a perfect tool for all of those who are teachers or instructing people. It allows me to easily grade assignments, make quizzes and flash cards, and shows the students progress, which makes everything run smooth and easily. Thus far, I haven’t found much that I haven’t liked. If I had to nitpick then I guess it would be the occasional bug that happens. However, they are quickly fixed, so it isn’t such a problem. As I said before, I can now automatically track a students progress, rather than shuffling through assignments and grades to see how things are going.
" a good training application"
At first we were thinking we'd use the Proprofs Quizmaker to create our quizzes to train our client users but maybe we'll switch to the Training Maker. Still thinking about it. could be a good tool for developing certification. Can be used to train internal staff as well as external clients. Fast, easy setup and has a professional look and feel. "Top-notch tool for online training and education"
Employee training on a massive scale. The kind of support it provides to us, from beginning to end, was unprecedented. It was an amazing experience. "The elearning system gives me quick access to organize information." It helps me to get the whole picture of what I have planned to do in daily life. Some tools are confusing but they are easy to use overall. It’s quick, organized, planned, and assist you to do more on the work. * We monitor all ProProfs Training Maker reviews to prevent fraudulent reviews and keep review quality high. We do not post reviews by company employees or direct competitors. Validated reviews require the user to submit a screenshot of the product containing their user ID, in order to verify a user is an actual user of the product. Hi there! 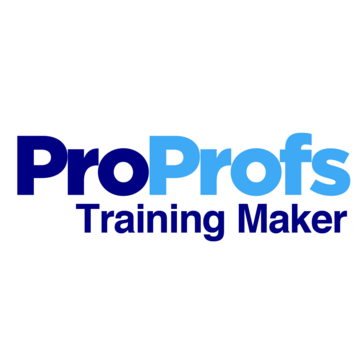 Are you looking to implement a solution like ProProfs Training Maker?